Welcome, contact club in advance. Ganton Golf Club played host to the 1949 Ryder Cup matches between the USA and Great Britain. Team Captains were Ben Hogan (US) and Charles Whitcombe (GB). The U.S. Non-playing Captain Ben Hogan raised a concern about the grooves on the clubs of some British players. A meeting was called with R&A Rules Official Bernard Darwin, who concurred that the clubs should be repaired to meet conforming standards. Despite the USA team being without three key players, Hogan’s side claimed victory after dominating the singles, USA 7 - GB 5. The Ryder Cup was played at Portland in 1947 and at Pinehurst in 1951. To classify Ganton as a heathland course is a misnomer – one could just as easily categorise it as an inland links, as it’s situated in the rural Vale of Pickering, nine miles from the sea. This sandy, gently undulating site was once a North Sea inlet. Consequently, it has all the characteristics of a links and a heathland course. Either way, Ganton Golf Club is a perfect place to play golf. The Scarborough Golf Club (as it was originally called) opened for play in 1891, laid out by St Andrews’ Tom Chisholm. 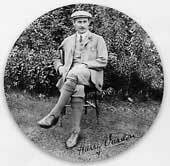 The great Harry Vardon became the club’s pro in 1896, the same year he won his first Open title at Muirfield. This immediately put Ganton on the map. In 1905, Ted Ray, along with James Braid, J.H. Taylor and Vardon implemented major alterations to the layout. Harry Colt, Alister MacKenzie, Tom Simpson and C.K. Cotton made further changes over the next 50 years. Ganton is surely one of the few inland courses in the British Isles good enough to hold an Open Championship. It would make a pleasant change to break with tradition and hold an Open somewhere inland. After all, Ganton is used to holding important competitions – it hosted the 1949 Ryder Cup, the 2000 Curtis Cup and the 2003 Walker Cup. If you blend the Old course at Walton Heath (minus the road noise) with Woodhall Spa’s Hotchkin course and then throw in a touch of Muirfield (without the sea), you’ve got Ganton. Nearly 100 years ago, Bernard Darwin compared Ganton to being “a little like Woking, a little like Worplesdon; and, generally speaking, it is the type of course that one would expect to find in Surrey rather than in Yorkshire.” Occupying open, windswept heathland, it’s a supreme thinking man’s and woman’s test of golf; the fast greens and firm fairways test the very best players. Various types of thick gorse, heather and broom highlight the course during the spring and summer months. Three short par fours provide the opportunity of a game of risk and reward for the big hitters. A minor downside is the fact that there are only two par threes but the strength of the par fours more than compensates for this. The 4th hole, a 406-yard par four, requires a solid drive to a wide fairway before an undulating green sited on a raised plateau is unveiled. The approach shot must carry across a gully and avoid a canny bunker on the right-hand side of the green. From the raised 5th tee, a short 157-yard par three, you have a great view of the well-protected green. Only an arrow-straight tee shot will suffice. Stray to the left and you will be swallowed up by one of two bunkers, stray to the right and you'll be trapped by a huge curved bunker, which wraps itself around the entire right-hand side of the green. Ganton is a friendly club that opens its doors warmly to visitors (providing you have a handicap). If you are a serious golfer and have never played here, we strongly recommend it. The first impression when you drive up to Ganton is that you are stepping back into a period of golf that’s full of tradition, where simplicity and understated style reigned. I love this feeling that some of the older clubs give out. Everyone we met was wonderfully welcoming as was the course. I can best describe Ganton as an inland links, at least in terms of turf quality and feeling. Everything is clearly sand based and the conditions are as firm and fast as I would expect. Truly perfect surfaces for golf, even early in the year. We scored a perfect day and the enjoyment of some early season on target form certainly helped the day to be great. The course has what appears to be a gentle start, that being said, don’t be fooled as danger is lurking in the form of some seriously gaping bunkers looking to wreak havoc. For the first time player, many of these are out of sight. The benefit of a wonderful host certainly helped point us in the right direction off the tees. Three holes in and it’s clear Ganton is going to throw every challenge and surprise at you. Starting semi straight on #1, #2 has a dogleg left and #3 a dogleg right. Take on the corners and you have a great shot at scoring well if you can navigate the tricky well-bunkered greens. The 4th is a wonderful short par 3 with semi hidden and very well undulated green. The course then throws a couple of gettable par 5’s your way where a good drive will allow an opportunity to go for the greens in two. The tricky part is that the drivers have to thread the needle to semi narrow fairways. Ganton continues with strong hole after strong hole, and by the time you finish the front 9 you realize how multiple rounds would be required to learn about this course and how best to play it. My favorite hole would be the par 4 15th which incorporates a wonderful natural wash area to visually distract your drive even though with today’s modern equipment this is not in play for average to long hitters. A long drive will catch a natural speed slot and allow a mid to long iron approach to a tricky green. While Ganton has a very strong finish, my one critique would be the 18th hole which somehow feels slightly out of context. It’s a decent hole but might need some bush and perhaps even a little tree removal. The tee shot is blind, which is fine, but what feels and look to be the natural line doesn't really work. Of course multiple plays would do wonders to help play it effectively but that still wouldn’t solve the odd feeling of the tee shot and all the trees and bushes that seem to be in play all of a sudden. Even so Ganton is well deserving of its position in the World Top 100. It’s a wonderful experience. Ganton, along with Royal Birkdale and The Honourable Company of Edinburgh Golfers (Muirfield) are the only clubs to have staged the Ryder Cup, Walker Cup and Curtis Cup. Its reputation as a top championship golf course cannot be disputed. Defining Ganton is not an easy task for it doesn’t fit into a typical category that many people like to box courses into nowadays. It’s not a heathland course as such, there is a little bit of a moorland feel at times and although it does play ‘linksy’ to a certain extent it’s almost ten miles from the East Coast. In truth it doesn’t really matter what type of course it is because it’s fantastic regardless. At Ganton you will face a series of demanding par fours, most of them topping the 400 yard mark and many of them much more than that, with the longest, the prodigious 15th hole, stretching to a whopping 493 yards from the blue tees. Indeed it is the two-shotters that really make Ganton what it is and coupled with the extremely deep bunkering, vast at times and often requiring steps to descend into the hazards, you come away feeling that you really have to be on top of your game if you wish to conquer it. And few rarely do for it’s certainly a tough assignment. There are a number of patches of gorse throughout the round that also add to the difficulty plus the open and exposed nature of the site is prone to fierce winds. Add into the mix that the exceptional routing continually twists you in one direction and then the other making judging even the slightest breeze more taxing than usual. At times a lot of the severest bunkers, which must be avoided at all costs, are slightly peripheral to the fairways and although punishing of a wayward shot they are not always key to the strategy of the hole. Straight down the middle and long is essential at Ganton on most of the sterner holes and is perhaps suitable for elite competition, however, I can imagine everyday play for amateur golfers can become unrelenting. For 16 holes Ganton is extremely good golf and doesn’t really put a foot wrong. However in my own opinion, one that’s not necessarily shared by others, there’s no disguising that the course ends on a bit a low note with the final two holes not quite living up to the very high standard it sets for the majority of the round. It’s perhaps a bit unfair to end the review of such a high quality venue on a bit of a downer but sadly that’s how the course ends too. Great review Ed. However, I am definitely in the 'others' category and am intrigued by what you say about 18. The tee shot is difficult, especially off the tips (which must be the proper way of looking at it). Feels like there is room out right but miss the fairway and it's a long second from the first cut, relax too much into slicing territory and you're in the trees/goarse/field. Left is the optimum line as the fairway slopes right but a tiny bit too far left and you have no shot to the green. Then there's the second shot into that massive, long green. Hard to get it up there, hard to stop it once on there. Slightly wayward there are bunkers left and right. A bit more wayward and there's little goarse ball magnets... Oh and then the green has a deceptively large swing on it. Certainly one hell of a matchplay hole if you get that far and for me, from 15 onwards Ganton offers one of the toughest finishes around. Highly subjective I know! Framed by the beautiful rolling hills of North Yorkshire, Ganton offers a portrait of England’s green and pleasant land like no other. The term “inland links” is often misused, but this is a befitting description of Ganton. Firm, fast running fairways and deep bunkers that are only rivalled by those at Woodhall Spa, Ganton offers a true but stern test. Yet it’s not the test that draws you to Ganton but its endless charm. This starts in the clubhouse where tradition rules and a jacket and tie is needed if you want to be invited into the members’ lounge. This charm continues on the course with details such as the quaint steps that provide you with access into those daunting bunkers or St Nicholas’ Church that offers the classic countryside backdrop to the 14th approach. The course is a shot-maker’s layout that demands you to put the ball in the right areas. Pockets of gorse are dotted alongside gently rumpled fairways whilst subtle run off areas around the greens will snaggle any slightly offline approach. There are doglegs, blind shots, short par 5s, long par 3s (play the 17th from the yellows) and plenty more to maintain your attention throughout the round. Sure, I’d agree with the reviewer below in that there are no holes that particularly stand out above any others across the course, but the eighteen holes you’re presented with are sure to test your metal. Some holes at Ganton are even a little quirky, the closing hole being the best example of this where you can stand on the viewing platform to watch your playing partner hit for the marker post before aiming your approach shot at a right-angle from the fairway and attempt to curve your ball around a tree. Old fashioned and quintessentially English, Yorkshire’s very finest is a course that stays long in the memory. I played Ganton for the first time a couple of weeks ago and it is a very fine course. If it lacks anything it is memorability, there are no stand out holes, just eightteen very solid ones. Yorkshire in general is very good, i highly recommend going there. I played Ganton on a cool, windy day in April. After a gracious reception by the staff, I found that the course very much lives up to its reputation as a tough but fair examination from tee to green. Fairways are well-bunkered and often lined with stands of gorse....as are the greens. The greens were in outstanding shape. As noted in the James Finegan book, the course provides a constant sense of pressure on your swing (or at least the swing of a low double digit amateur). I found myself playing the longer par 4s as par 5s in order to stay out of trouble off the tee and around the well-trapped greens. None of this is intended as a criticism, just as a reminder of why this course has hosted many significant championships....a high level of play is required to score well. I'm told the wind I experienced is more or less the prevailing condition, resulting in a hard, fast track. I thought I had salvaged a memory during an otherwise mediocre day of scoring on the ~230 yard par 3 17th, but my three wood rolled over the green and I failed to get up and down for par. Still, a real treat for a serious golfer with a sense of the game's history. Would visit again in a heartbeat. I love golf in the British Isles and visiting Ganton is no exception. The course is located in North Yorkshire which has beautiful rolling countryside and impossible to decipher thick accents. The nearby North York Moors are a national park and the areas surrounding Ganton are comprised of moors rich with bracken, heather and grass that give off a glowing color. The area has a purple hue in the summer from the bursting heather. There is something mysterious and romantic about this part of England and its old stone walls and alluring views. Ganton is golf from the old school. Aside from 150-yard markers, there are no yardage markers at Ganton. The tops of the flag sticks DO NOT have a GPS target in them. This is golfing the old fashioned way, played by feel, trying to judge the wind and distance by eye or from the distance measured by a bunker or a tree. No golf carts here. This is pure golf. 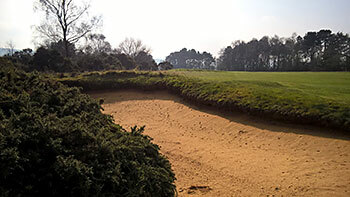 I suppose that deep bunkering is part of the character in the north of England because Ganton also has deep, penal and large bunkers in the style of nearby Woodhall Spa. These are bunkers so deep that you need a ladder to climb in and out of them. I played Ganton without a caddy in sunny, windy conditions. The winter sun was at a low angle in the sky with the crisp air filling my lungs. The course has a relatively easy start and the front nine isn't terribly difficult or dramatic, although you quickly get a sense that it is wise to stay out of the bunkers and to look around at the idyllic countryside in all directions. Ganton is not unusually short by today's standards, with back tees of 6,935 and would be a real challenge with the wind blowing. The growing conditions in this part of England are ideal due to the rain and cool temperatures, thus, the greens and fairways are as good as any course in the world. I particularly like the 258-yard par three seventeenth hole, where you must hit your tee shot across the entrance road to the course. Yorkshire men are known as a hearty breed, and this hole is built for them. Made second visit here today a few years after the first time - and it beat me up again ! GREAT course with numerous MASSIVE bunkers - some fairway bunkers 200 yards out and you are doing well if you get out let alone make any yards !! Apart from bunkers and even though I could not a hit a cow's a*** with a banjo today I still cant quite work out why it plays so hard BUT IT DOES !! The second day of our annual golf trip to the British Isles, we had the pleasure of playing the golf course at Ganton GC the 17 of October 2015. We traveled with a Norwegian, who lived in York a few years ago. He has boasted very much of the golf course, so it was with high expectations we arrived the course.We were warmly greeted by a very nice lady in the Pro-shop, providing us all we needed for a nice day on the golf course. While we were warming up on the driving range, the caddie-master contacted us to ensure that everything was fine and that we were ready to start our game on schedule. He also showed up at the first tee to take the important "before the round" photo with clubhouse in background.The course was very interesting with very well designed golf holes. The course have no weak holes. Bunkers and Gorse will challenge you during your round. I do like the layout of the fairway bunkers that more or less always gives you at least a half-shot penalty to get out.The first hole is a short par 4 hole with very well placed bunkers and gorse that one should stay away. I feel that the first hole gives you the opportunity to get a good start of your round of golf.I love the third and the fourteenth hole, short par fours, which can be reached in one shot by long- hitters, but also provides some interesting challenges for those who choose a two shot strategy. Perfect holes for match playThe first two par three holes on the course is quite easy as long as you avoid the bunkers. Once you reach 17 tee, the impression of simple par three holes is long gone. The view up the hill towards the green 235 yards from the tee is fantastic. Personally, I perceive this hole as too long from the club tee.Once you pass the green on the left side of the fifth hole, be careful with the water hazard on the left side of the green. One of the players (a Norwegian) in the group behind us parked his trolley in the wrong direction before entering the green to make his put. His trolley decided that it needed a bath, so it started his trip into the water. Luckily, he was able to rescue the trolley, bag and all its contents.A much-appreciated visit on a golf club with a course that is “must play” if in Yorkshire.Lars Stensrud, Oslo, Norway.